We run various sports for children from Prep to Year 12. We are proud of the increasing number of girls participating in girls or mixed competitions. Players of all standards are welcome and games are graded accordingly. Participation is the key and every child receives an award at the end of the season! This year we are running our sports by school Semesters so we have 2 junior seasons instead of 4. Junior sport starts the first week of each school term and finishes the week before the end of the school term. We are registered with the Queensland Government "Get Started Program" which assists eligible families to funding for their children to encourage participation in sports. We advertise when this funding is available on our facebook page as there are limited numbers available. Vouchers are worth $150 per child. Every Thursday from 4.00pm during the school term. We offer a group coaching session that takes the form of skills sessions and games. 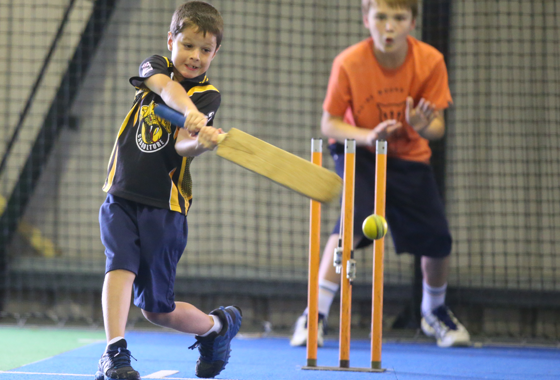 Children are grouped according to age and ability, they will learn all the skills of indoor cricket - how to bat, bowl, field, run between wickets and throwing at the stumps - in a hands-on experience supervised by experienced cricketers. There is also an opportunity to play Majorleague representative cricket for Caboolture Indoor Sports. Speak to any of the coaches to get more information on this. Some high school aged children who have a good understanding of the game and have the required skills play in the lower grades of our ladies and mixed competitions. Please contact our Senior Netball Coordinator Deb Bruce on 0407 134 053 if you think your child may fit into this category. Skills session from 3.30pm every Friday during the school term for those not participating in a team and would like to learn soccer. Children participating in this session progress into the graded competition when they are ready. A full graded competition for boys and girls. This is broken into divisions, taking into account age, size and ability. The competition draw is published on our website - www.cisc.net.au. Go to the website & click on ... Game Times ... tab. Please note: We need a parent to manage each team and take responsibility for having full teams each week. Please see our staff if you can fill this important role and more information will be provided. Check information above for starting times. Game Fees: $5.00 per player (first game free for newly registered players). There are no family discounts because this is FANTASTIC VALUE!!! Registration: $10.00 per player per school semester for all children from Prep to Year 12. No costly uniforms. Our aim is to keep the costs low so families have the opportunity to allow children to play sport.